Enter a width and height, and leave the other entries as is. You may also enter a Name (as I did here) for the file or do it later when you save the file. 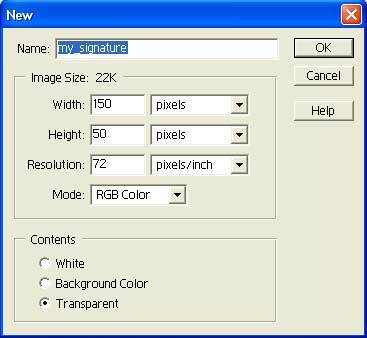 Note that it is important to set Contents to "Transparent" because you want your signature to float over your image. At this point, all we have is a new file with a transparent background (represented by the white and gray checkers). I find it is quite difficult to see anything drawn on a transparent background, and prefer a white background to work with. So let's create a background layer and fill it with white.